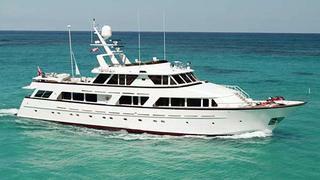 A call to Y.CO brings news that they've added the 37.5m motor yacht Endless Summer to the sales fleet in Fort Lauderdale. Built in aluminium by Australia's Lloyds Ships in 1984, Endless Summer has been regularly upgraded, most recently in 2012. Accommodation is for 12 guests in two master suites, a VIP stateroom and two triple cabins while twin 1250hp Caterpillar engines give her a cruising speed of 12.5 knots. On display at the Miami show, Endless Summer is asking $3,375,000.